The biggest, wealthiest city in the whole of Calibran is its capital, the seat of the Dragon Throne: Cathedra’s Gate. It’s the home of thousands, one of the safest places in the kingdom, surrounded by high walls and guarded by vigilant watchmen and the latest in military technology (for a medieval society). It is also one of the deadliest places in Calibran, swarming with thieves and cutthroats. It’s filled with people from all over, some of whom are undoubtedly desperate enough to do just about anything. 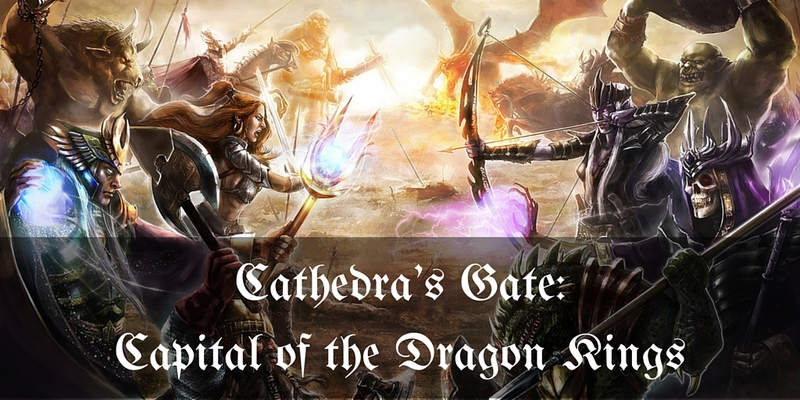 The creative team took a great deal of care in creating Cathedra’s Gate. It’s the biggest city in the Kingdom, and to a certain extent it is the focus of culture as well as the center of government. We, writers and readers both, are going to be spending a fair bit of time in the city, in the saga and side stories, so it’s important to have a solid picture of what it’s like. Also, it helps if it’s realistic enough to be believable while still being fantastic enough to be interesting. The city lies at the mouth of the Serpent River, the Old Blue Snake, the place where it empties into the Great Western Ocean. Steel weapons and tools forged by dwarves in the far off mountains, the surpassingly subtle wine of the wood elves, and grain from the Fields of Farsalon coming down the river meet fish caught in the ocean, spices from the Silent Sands, and travelers from all over the kingdom. It’s the crossroads of Calibran, and all roads lead to it. The obvious question, of course, is who is Cathedra, and where is this gate that everyone is talking about? The city has been there at the mouth of the Serpent River, in one form or another, far back into the mists of time, and so the origin of the name is something of a mystery. The elves may remember precisely what the real story is, but as they usually do their best to avoid answering direct questions with straight answers, no one is really sure what the truth is. Legend and myth has provided a couple of answers, however. The first claims that at one point the city, or at that time the town that would grow into the city, was protected by a great human wizard named Cathedra. This wizard was powerful enough to keep the dragons away, creating a refuge for the mortal races of Calibran. Safe places being in short supply, people flocked to Cathedra’s town. It became a center of culture, learning, and trade. In other words, it became wealthy. It became a target. Eventually it became too juicy of a target, and while the dragons let it be, some other powerful, dark creature came to threaten the city. Whether it was the wealth that brought this threat, the growing population, or the magical power that had come to be gathered there that led the monster to attack has been lost to time. Cathedra came to the city’s defense, acting as its shield and sword once more. The powerful wizard and monster fought each other to a standstill, each draining the other’s power without finding an advantage, a way toward victory. Eventually, his magic flagging, Cathedra held off the monster long enough to create a solution. Instead of simply killing the monster, which seemed too powerful to die, he locked it behind a huge gate, a ruin that was the remnant of some yet older civilization. Cathedra sealed the monster beyond the gate, and there it has been imprisoned ever since, still bound by the wizard’s power. The gate, weathered by time to the point it looks like a simple stone outcropping, can still be seen in the city. Eventually Cathedra disappeared. Perhaps, being human, he reached the end of his span of years and died. Or perhaps he grew powerful enough to pass beyond some other way. In any case, to honor the man who had protected them for so long, the people of the city renamed it after their wizard and his greatest test. The other story is much more mundane, but perhaps it seems a little more believable. Cathedra’s Gate, lying as it does at the mouth of the Kingdom’s biggest river, sheltered from storms behind a small archipelago, was a prime place for a city. Trade flowed, people came, and inevitably trouble came with them. To protect the trade that was the lifeblood of the city, at every gate was a table, or in the language of the time, a cathedra, where weapons were deposited before entrance to the city was allowed. Eventually the idea became conflated with the city, and it became known as Cathedra’s Gate. That story’s not as fantastic. Some think it more likely to be true. In a world where dragons fly overhead and genuine magic is worked casually on street corners, though, the possibility of wizards wrestling dark monsters into thousand-year prisons should not be discounted. As an ancient city in a perilous world, Cathedra’s Gate has outgrown its walls three times. The first wall surrounds the center of the city. All that remains of it is a slight rise, and a few ancient gate structures that are missing stones like missing teeth. The second ring can still be seen in some places around the city, ruined stretches of low stone that break up streets, and serve as an ersatz fourth wall for many buildings. The third is still whole, ringing the city, not as tall as the modern walls but still sturdy and serving as a second line of defense within. Beyond it are some of the larger houses and mansions, the newest construction, where the wealthier craftsmen and artisans live. The fourth ring of walls are some of the tallest structures in Calibran. Dwarven builders and stonemasons worked closely with human architects and inventors to create marvels of technology, elaborate devices used just to build the walls to their great height and then destroyed. On the tops of the walls sit trebuchets, ballistas, and other engines of war, each the product of a technical mind combined with the skill and magic of its builders. Officially, the city ends at the fourth, modern ring of walls. Construction beyond that point is forbidden, and the constables and military are diligent in preventing new building that might offer cover for enemies, or a shortcut to the top of the walls. In reality, there are temporary buildings there that are thrown up to sell goods or house newcomers, then taken down before anyone can object too strongly. Docks are built out onto the river, and boat houses. There is a fair bit of traffic on the roads and waterways leading in and out of the city, and with money to be made, people are willing to risk the constable’s wrath for the chance to make a quick golden scale or two. The river flows through the walls, but the engineers that designed the city’s defenses were not willing to leave so large a gap. So, the Rivergate was designed and built, a great, moving structure, the largest in Calibran, that can be closed in times of emergency. Around it is the Rivergate district, where most newcomers enter the city. It contains a number of Inns and restaurants, as well as a collection of canny tricksters waiting to fleece the unwary. Within the city are many neighborhoods, towns swallowed whole by the city hundreds of years in the past, and slums guarded by sly men with narrowed eyes. In the center of the city is the Royal Compound, which is almost a city onto itself. Aramnor Plaza is the large area before Aramnor’s Castle, the public face of the Dragon Throne. The walls of the castle loom above the plaza, and are guarded by grim faced soldiers. Inside the castle is no less intimidating, though now it is apathetic bureaucrats petitioners face on their way to seeking an audience with the King. Behind the castle is Belgrave House, once the home of Johelm Belgrave, the Kingdom’s founder and national hero. It was usurped by Aramnor, the first Dragon King, a point that still irritates the modern noble Belgrave family. Griffon House, their new home, sits grumpily across the plaza from the Royal Compound. Also found behind Aramnor’s Castle are the Royal Libraries, wizards’ laboratories, armories, gardens, servants quarters, and everything else needed to keep the administration of the Kingdom on course. Also to be found in the city is Caster’s Square, a public space in the heart of the city where merchants come to sell goods, and friends meet over a mug of ale or cup of wine. The Arena, where the Games are held every few years is also an easy to spot landmark. Cathedra’s Gate is the largest city in the Kingdom, and it is the center of it in many ways. Not only is it where the government resides, it is also the center of many political, criminal, and magical webs that stretch across Calibran. Every conspiracy eventually comes to find its place in Cathedra’s Gate. Order The Dragon King (Chronicles of Calibran Book 1) now.